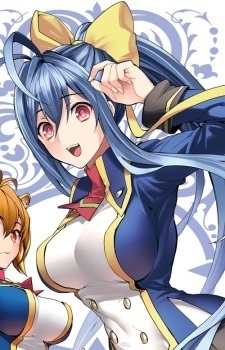 Mai Natsume is the protagonist of the Remix Heart manga, the Variable Heart manga and the two Remix Heart Gaiden side-stories in the game Chrono Phantasma Extend. She was a classmate and friend of Noel Vermillion, Tsubaki Yayoi, Makoto Nanaya and Kajun Faycott as well as the schoolmate of Jin Kisaragi and Carl Clover during their time at the Military Academy. Mai is kind and polite, however she possesses great inner strength and tries to help and protect those that she cares for. She has magenta eyes, long blue hair tied in a ponytail with a yellow ribbon and an athletic body with a large chest. Mai's true name is Mai Hazuki and is the heir of the Hazuki Family, one of the twelve noble families that govern the world. Shortly prior to the events of Remix Heart, a grimoire magically transformed Mai from a boy into a girl. She was not able to reverse the transformation and her father sent her away to the Torifune Military Academy under an alias. Mai is the vessel of the Nameless Grimoire, which grants its user the ability to read the memories or thoughts of people or obtain information about objects or their owners by tasting them. In the case of food she can percieve the thoughts of its cook, which is why she is not only able to "survive" Noel's infamous death cooking, but also calls it a godly dish because Noel's single-mindedness in cooking only leaves her innocence within the food. In addition, the Nameless Grimoire can enhance its vessel's physical abilities and allow her to regenerate her injuries. Mai prefers to fight with a long sword and a parrying dagger during Remix Heart, but obtains a powerful enchanted spear called Outseal that is a Legacy Weapon in Variable Heart.